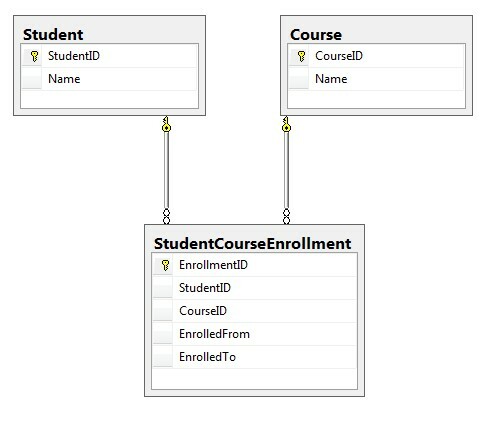 Entity framework handles tables participating in Many to Many relationship in a nice manner. If the junction table (sometimes called bridge table, association table, link table, etc) only consists of the foreign keys and no other columns, then that table is abstracted by EF and the two sides get a navigational property exposing a collection of the other side. If the junction table contains other fields as well (e.g. the table has its own primary key column), then that junction table is included in the model with many-to-one relationships with both the participating tables. 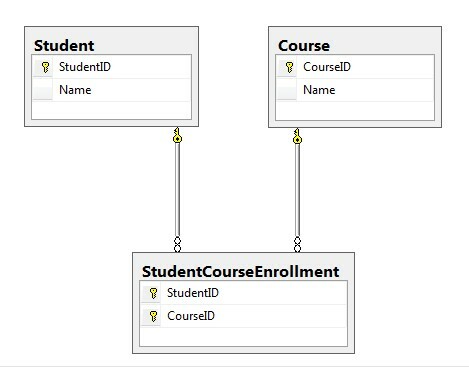 This post will present some common LINQ queries involving the many to many relationship tables in both scenarios: when the junction table is abstracted by EF, and when it is exposed. In the above situations, the Any() method is translated to where exists() expression while the other SelectMany methods are translated to join expression. Notice that such query will use the Contains methodology that is only available with Entity Framework 4. For similar queries with EF1 (EF3.5) we can use the BuildContainsExpression() extension method described here. Thats’s all. I will include some more queries in case I find interesting. Notice that same queries can be written for LINQ To SQL also. The only difference is that the bridge table is always included in the model, so always we need to refer to case 2 from this discussion. this is great ,i love it! What are the “dc” and “s” objects above. I was thinking dc was your context but then you use S in the next line. I’m sure this is a newby question but I’m struggling with this and using it in MVC2. But how do you save to such a relationship? I’m trying to implement exactly your 1st scenario I have 2 tables that are linked with a junction table. But when I run the project I get all employees returned instead of just from the single department. Any idea why this would not work? This is in VS 2010 express using the repository method similar to the nerdDiner sample project. I’m trying to implement your first scenario but in reverse: I’m looking for all the students NOT enrolled in a particular class. yet it pulls back no resuts. Any help? And how can I update this? I am trying something similar to this and cannot figure it out. I will show my lack of knowledge first and say I do not know what Entity Framework is. Looks maybe like a newer version of Access? Anyhow I have 2 simple main tables. 1st is Clients Table with CID(PK), CFirstName, CLastName. 2nd is Skills Table with SkillID(PK) and Skills. The 3rd table is a join table with CID & SkillID. It sounded simple to me in the beginning, but all I want is to return a query/report to tell me which clients have at least X number of selected skills. I work in public service and we need a way to match clients to jobs that come in. So an employer may call and ask for people who have experience with welding, carpentry, and plumbing. I need to return individuals who have at least those 3 skills. Or if the employer just wants welding, I need to pull individuals who at least have the welding skill. Everything I have tried to this point returns results of individuals who match any of the skills and the last thing i tried was a listbox that ended up making me select all of the skills that a client had before they would come up. so if someone had 3 skills and I only asked for one they wouldnt come up. Customer and Site are two tables where joining table is CustomerSites. All i want is to fetch the list of site for a particular customer which are not yet joined into the CustomerSites entity. as well as, I want to fetch all the sites which are not yet mapped to a customer in customersites. That is like one of the clearest explanations of this I’ve seen. Thanks so much! You’re the best with this excellent blog. You make Selects easy. You know… the other 3/4, i.e. the CUD part of CRUD? …and Left Outer Join for Many-to-Many? I thought first that it is some bug in the Model not generating the respective Entity in Text Template and that in the Model itself ! Superb Article about EF M:M.
4 images + avatars and code is showing up in Chrome fine. I must show appreciation to this writer just for rescuing me from this type of trouble. world and meeting views which are not pleasant, I figured my entire life was over. and the kind that would have badly affected my career if I had not noticed your web page. The competence and kindness in taking care of almost everything was precious. I don’t know what I would’ve done if I had not discovered such a solution like this. It’s possible to at this point look ahead to my future. Thank you so much for your impressive and effective help. requires direction about this topic. Thank you so much for this. I’ve been having a lot of trouble Entity Framework, specifically with that association table with payload/metadata. And while I thank you for your examples on how to select data,. do you have examples on how to go about basic CRUD functionality with the association table. You may just have saved my job with this post.. 🙂 Thank you..
Great article. Precise and clear. Thanks a lot. Thanks for this! I’ve been going round in circles searching Google as my problem would leave me with Lists of EntityCollections. Fixed my issue with your first example (unfamiliarity with the Any() function). If you had only written: “If the junction table contains other fields as well, then that junction table is included in the model”, that would’ve been enough for me, I failed to understand this, now I get it. Thanks! It’s actually a nice and helpful piece of info. I am happy that you shared this helpful information with us. your examples, are really good! How do you manage when you need to add a new course, with more than one student? The same example, for edit. i did it this way tell me what i’m doing wrong. 2.- I run the migration an update the database. 3.- Then when i look on Mangemet Studio everything is okay we have the the three tables “Students”,Courses”,”StudentsCourses” the last with just the two FK’s that are needed. 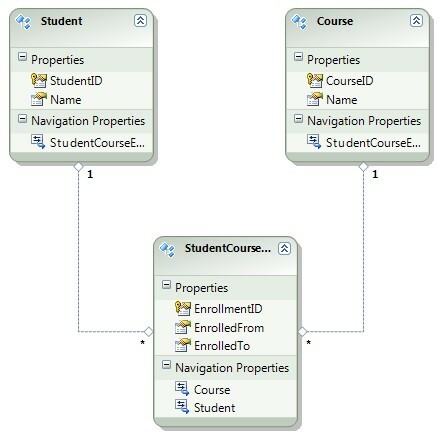 4.- If we make a query Let’s say in the students table to get all of the students and while debbuging we take a Watch on the obj’s that we are geting from the query the course collection of each of them is null. so what is wrong with this.